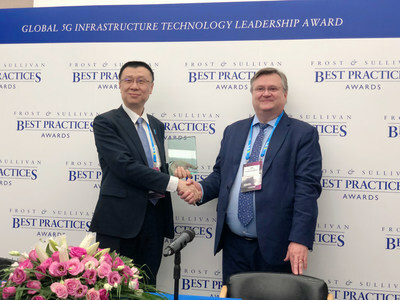 SHENZHEN, China, Feb. 27, 2019 /PRNewswire/ — ZTE Corporation (0763.HK / 000063.SZ), a major international provider of telecommunications, enterprise, and consumer technology solutions for the Mobile Internet, today was presented the 2018 Global 5G Infrastructure Technology Leadership Award at Mobile World Congress 2019 by Frost & Sullivan for being a leading provider of 4G, Pre5G, and 5G infrastructure systems, equipment, and devices. Each year, Frost & Sullivan presents the Technology Leadership Award to companies that demonstrate leadership in developing and leveraging new technologies that offer significant customer value. ZTE established its leadership in 5G by investing heavily in 5G standardization and product R&D, and subsequently deriving profound insights into 5G technologies. Working in 5G deployment for years, ZTE has launched a series of commercially oriented all-band 5G AAU, 5G transport, 5G core network, 5G devices, and other end-to-end 5G solutions to prepare for large-scale 5G commercialization. ZTE’s full series of 5G base stations can be deployed in various 5G scenarios, helping operators build wide-coverage, high-capacity, rapid-deployment, and cost-effective 5G networks. In terms of architecture, ZTE’s flexible solutions are capable of satisfying operators’ requirements at different stages of 5G deployment, from SA (stand-alone) mode to NSA (non-stand-alone) mode. In December 2018, in association with Qualcomm and China Mobile, ZTE completed the world’s first 3GPP R15-compliant SA 5G data connection at 2.6GHz by means of commercial 5G base stations and 5G devices. In the core network field, ZTE’s Convergent Common Core solution, based on 3GPP R16 SBA+, adopts the advanced technologies of CUPS, distributed resource pool, and network slicing to help operators quickly build an agile, efficient, and converged core network, fully addressing diversified requirements of 2G/3G/4G/5G/fixed networks and vertical industries. In the transport field, ZTE’s 5G Flexhaul solution covers all scenarios ranging from front-haul to back-haul, leading in latency, high-precision clock synchronization, and network slicing. At present, the full series of ZTE’s end-to-end transport products are ready for commercialization. So far, ZTE has declared over 1000 families of 3GPP 5G Standard Essential Patents (SEP) to the European Telecommunications Standardization Institute (ETSI). In addition, the company initiated and played a leading role in fostering Non Orthogonal Multiple Access (NOMA) by guiding the core project research needed to establish the NOMA standard. Frost & Sullivan Best Practices Awards recognize companies in regional and global markets that demonstrate outstanding achievements and superior performance in leadership, technological innovation, customer services, and strategic product development. Industry analysts compare market participants and measure their performance through in-depth interviews, analysis, and secondary research to identify the best practices in the industry.